Food is one of life’s great pleasures, and every few weeks I’ve been sharing with you some of my favourites, or giving you the low down on my taste and nutrition opinion on foods. Here’s some things I’ve tried the past few weeks. In case you’re interested, for a 50g bag, the nutritional information is as follows. 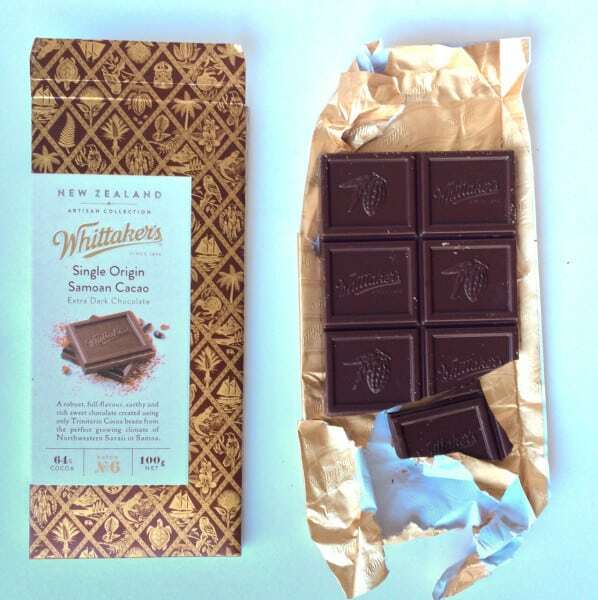 So the new range of Whittakers chocolates have hit the shelves and the flavours sound amazing. I bought this dark chocolate for a recipe, but of course I tried a few sneaky pieces before I used it. It’s divine. Creamy, rich and flavourful, it’s got that great melt in the mouth feel. I love the thin pieces too. I also tried a few pieces of the salted caramel chocolate and that was delicious too. Has anyone tried any of the other flavours? I really want to try the white chocolate with apple and vanilla! 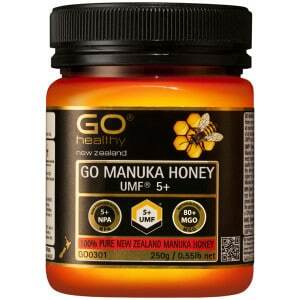 Manuka honey contains an antibacterial component called methylglyoxal (MG). This is found in most honey, but only in small amounts. It’s higher in manuka honey because manuka flower nectar contains a compound called dihydroxyactone. This is then converted to metylglyoxal (1). Manuka honey is delicious, but consuming it doesn’t protect you from bacterial infections. Most of the benefits of manuka honey has been around assisting with healing wounds (this is a special medical grade of honey, not the stuff from your cupboard). You can read a bit more about medicinal uses of honey here. My favourite use for honey is a hot lemon and honey drink. It’s very soothing on a sore throat – I’ll be using my honey for this purpose. You can buy it online here. 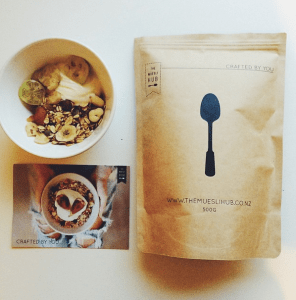 The Muesli Hub is a great concept. You go online to their store and make up your muesli just as you like it – choose your favourite nuts, seeds and fruits to go into one of their specially crafted bases. The base mixes include a gluten free mix, as well as a bircher, toasted and dry roasted blend. After choosing your base you can add in whatever extra goodies you wish. I’ve just been dreaming up a blend of brazil nuts, blueberries and mango with chia seeds. As well as creating your own, you can buy some of their premix blends. I was sent the Honey Roasted Bliss blend to try which is a blend of whole-grains, seeds and nuts in NZ honey to lightly coat them. 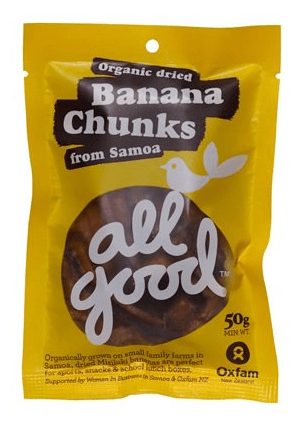 This mix is then topped off with dried apricots, banana chips and yummy yoghurt coated cranberries. It was very tasty, and not too high in sugar either. A 50g serve contains 5.4g of sugar, and also gives you a fibre boost, with about 4g of fibre. I’ve been having mine with Greek yoghurt and feijoa – it’s a delicious combination. This brand is $16 for 500g. You can get your own here. Have you stumbled across any new foodie finds this week? Previous Post: « How much water do you really need to drink? The Apple and Vanilla and Pear and Honey Whittakers are very very sweet. The apple has freeze-dried apple pieces which are a really nice flavour and texture, but the pear has “pear and honey pieces” which are quite chewy and stick to the teeth tenaciously. I still want to try the chilli and maybe the tea, not 100% sure how I feel about the tea one though! Love the idea of the Muesli Hub, but it’s so expensive that I can’t get behind it. It would be SO much cheaper to just make your own, and really easy as well. It is cheaper to make your own 🙂 I guess for those that want to make their own, but don’t have the time, or don’t want to go out and buy bags of nuts/fruits etc, it makes it a good option.